When Matthiessen went to Nepal to study the Himalayan blue sheep and , possibly, to glimpse the rare and beautiful snow leopard, he undertook his five-week trek as winter snows were sweeping into the high passes. This is a radiant and deeply moving account of a "true pilgrimage, a journey of the heart". I cannot say enough good things about this book. Peter Matthiessen has, alas, left us but his writing will live on forever. This is the kind of book you take with you on a backpacking trip and savor over and over. Like Desert Solitaire, or A Sand County Almanac, or Thoreau's Journals. This is a book that can't be adequately described in a review. Anyone who has ever identified as a seeker of any kind should read it. part contemplative travelogue, part Buddhist primer...intriguing reading so far. National Geographic ranked "The Snow Loepard" #12 in its respected list of 100 all-time best travel and exploration literature. It opened new vistas in the travel literature genre, combining spiritual quest, autobiography, nature writing and travel/adventure literature. It also won the National Book Award. What I liked best was Matthiessen's writing style. It is so first person that several times it seemed like I had suddenly become brilliant in fields like anthropology and zoology. So this is what it must be like to be someone who is aware and educated about pretty much everything they lay eyes on. Matthiessen's The Snow Leopard is his account of his two months in Nepal. He was invited along by field biologist George Schaller on his expedition to study Himalayan Blue Sheep--and perhaps catch a glimpse of the elusive snow leopard. (Said in the book to consist of only 120 remaining individuals. Thankfully, at least according to the Wiki, the current population is estimated to be in the thousands.) So on September 28 of 1973 "two white sahibs, four Sherpas, fourteen porters" assembled to make their way up the Himalayas. As the introduction notes, the book begins like many a "scientific log" with maps and ends with notes and index, and this book was found in the nature section of my neighborhood book store. And the nature and travel part of this narrative was superb. Matthiessen has a gift for bringing to the page vivid details of the landscape and people, painting it so vividly you hardly yearn for photographs. His writing at times approaches poetry and there are many beautiful passages. A healthy mix of travel memoir and Buddhist doctrine. Some of the sociological commentary is poorly footnoted and suspect, but thought provoking nonetheless. I read this about 15 years ago, and was not all that impressed. I like it a lot more this time. I think the contrast b/t the two main subjects is a great dichotomy. A good book to read in mid-winter. Matthiessen takes a trek to the Himalayas along with a naturalist, looking for some sort of insight, and finds that the journey and his companions were more important than the destination. That summary sounds trite, but the novelistic diary form is generally interesting reading. It provides interesting looks at rugged adventure in the mountains before satellite phones and space-age gear. A fascinating trip into mystical realms. Ostensibly a non-fictional story of Matthiessen's trek into Nepal, it also traces his interior journey/development. I enjoyed the contrast in the book of the banal and the majestic. It more closely resembles the realities of life where even the most magical moments are only seconds away from the earthly realities of a rock in your shoe, the biting cold, falling behind schedule. Matthiessen is prone to the same pains and failings as the rest of us which makes him such a compelling character. My favorite Matthiessen book. Adventure, beauty, hardship, sadness, natural history, regret, this book has it all. I've read it several times and will certainly read it again. 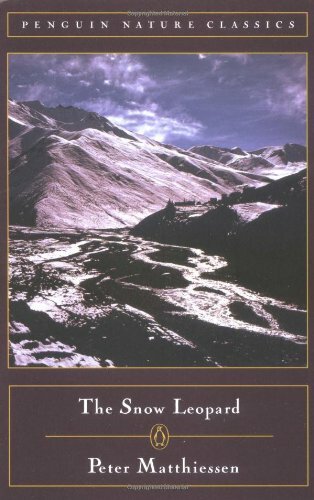 This book back great memories of our very spiritual trek through the Annapuna Ranges of the Himalaya's. Peter Matthiessen captures a very moving account of his pilgrimage to find the Lama of Shey, at the shrine on Crystal Mountain. Matthiessen describes his very personal journey to Dolpo, a very remote area in Nepal. While officially on a field trip researching mountain sheep the trip is journey inward, more like a pilgrim. A very personal account of both a physical trek in Dolpo region in the Himalayas in search of the snow leopard, and a spiritual journey. As with all things Zen, words fail, but when you read the book you'll get it and the book will stay with you. This wasn't what I expected. I guess I should have read the description and/or reviews a little closer. I thought it would be about snow leopards, like Tigers in the Snow was about tigers, their behaviour, their habitat, conservation of, etc.